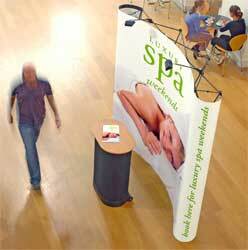 The Advantage Pop Up Stand is the total display system package! Ideal for shows, exhibitions and retail environments, the Advantage will give you a professional image at an affordable price. The hardware is made from 100% recyclable aluminium and comes complete with a choice of two sizes. Choose from either a 3x3 or 3x4 curved pop up system; both kits include one set of full colour fitted graphic panels, lights, wheeled pop up case and lectern conversion kit as standard. The Advantage is constructed from a lightweight and strong aluminium frame in a striking black finish. The system features magnetic locking arms, magnetic bars and magnetically attached panels making it quick and easy to set up. The Advantage creates a seamless graphic display every time. The Advantage is supplied with a black wheeled pop up transit case, frame bag and a mag bar bag to keep all the components together. 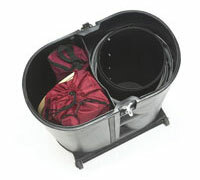 This makes the Advantage highly portable and easy to store. 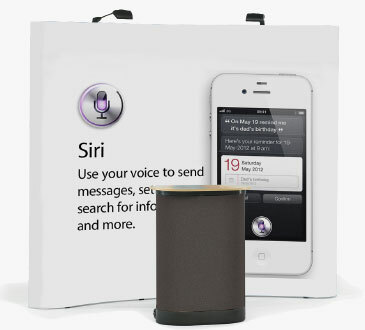 It comes with a fabric wrap and the beech laminate top so the pop up case can be easily converted into a useful plinth. What is a 3x3 or a 3x4 Pop Up Stand? Pop Up display systems are specified by the number of sections used in the construction, which means your stand can be constructed to the correct size for the space available.